Although you’ve been having bowel movements for quite some time now, it may surprise you to learn you’ve been doing it wrong. In the West, we are used to and conditioned to believe the design of a standard toilet has been perfected. New toilet designs are visually attractive and great for minimizing water waste. However, the way it affects your body hasn’t changed since Thomas Crapper produced his first flush toilet in the 19th century. For a healthy digestive system, you should have a bowel movement every day—ideally once after every meal. Your body is not in an ideal position when sitting on a commode. Your colon is a tube and when sitting, the tube is kinked. This kink is restrictive to your bowel movement—not allowing complete elimination. It’s believed colon cancers are more likely to occur in these kinked areas. A squatting position is desired for complete elimination—Stanford University supports this in a study. There is no kink in your colon while squatting. Animals defecate this way, as do humans in other parts of the world. Some countries use squat toilets, which are essentially openings in the floor—not practical for us Westerners as we’re not about to give up our toilets. There is a simple solution for less straining and complete elimination, while retaining your commode. 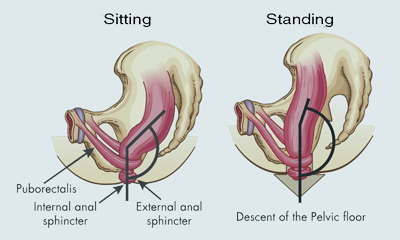 If you elevate your legs and place your feet on a stool-like device, it will place your body in the proper position to avoid the kink in your colon. It works well and after a short while, it will feel completely normal to you.